Teachers' unions told the Daily News on Sunday this week that there has been a heavy presence of military personnel especially in high density suburbs who make impromptu visits at public schools. "We have seen interference of military, police and CIO (Central Intelligence Organisation) to try and push teachers into schools during this industrial action," said Tapson Sibanda, the secretary-general of the Zimbabwe Teachers Association (Zimta) - the biggest educators' union in the country. "Soldiers just come and stand at schools and there is a lot of victimisation of the teachers; they say it is for our protection but really what kind of protection do we need at the moment, it is just to victimise and pose a threat so that teachers are in schools." "The militarisation is against the spirit of the Oslo Safe Schools Declaration of 2015. We encourage the Zimbabwean government to urgently sign the declaration and guarantee safety of learners and teachers in schools," he said. Zimbabwe Democratic Teachers' Union president George Mushipe said a punitive response to a legitimate industrial action will not help matters. Said Mushipe: "There is no need at all for non-education players to harass, intimidate, threaten, harm or injure teachers". This was after Senator Jane Chifamba had requested deputy Defence minister Victor Matemadanda to cause the withdrawal of soldiers from schools to create a freer learning environment during Thursday's question and answer session in the Senate. In his response, Matemadanda said the country's Constitution allowed the deployment of soldiers anywhere if the police are overwhelmed. "….the army does not deploy itself; they are deployed by the police. 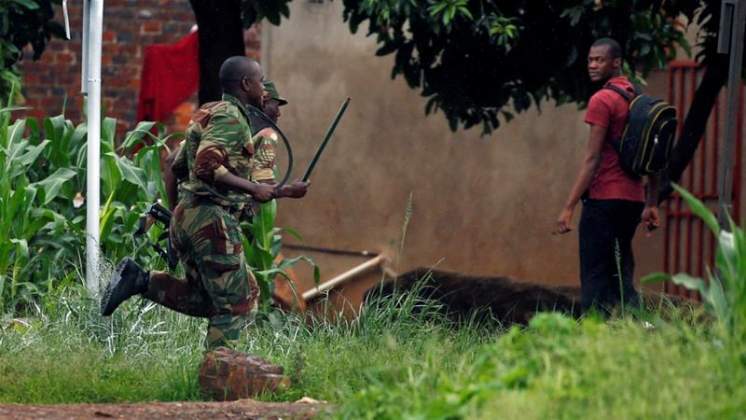 If at school there are people who are armed and beating people, the soldiers will go and remove those people," said Matemadanda. There has been increased presence of soldiers in urban areas in the aftermath of last month's stay-away triggered by President Emmerson Mnangagwa's announcement of a 150 percent increase in fuel prices. At least 12 people died after the army shot at protesters, with over 70 people sustaining serious gunshot wounds. Speaking on the sidelines of the "March for Justice" protest organised by the Law Society of Zimbabwe, Mtetwa said there has to be an end to this, adding that legal process must be allowed to take precedence. "We are saying there has to be an end to this, if you have committed a crime you must be arrested and be given due legal process, there shouldn't be instant justice as we are seeing. "And we are saying no State of Emergency has been declared so why do we have the army all over the place, this is what we are asking for we just had an election, why are we going through this process, if there is a State of Emergency then let it be officially declared and we know why it is there," she said. "Well, as long as the Zimbabwe Republic Police (ZRP) is on top of the situation and they tell us that they are now in control and in charge, there is no reason for us to continue with the deployments because we have other commitments elsewhere, particularly training during peace time to perfect our skills and professionalism," he said.